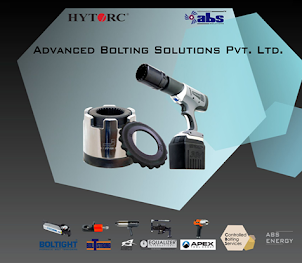 Torque wrenches and bolt tensioners are two of the most common means of tightening large bolts, where high bolt loads are required. 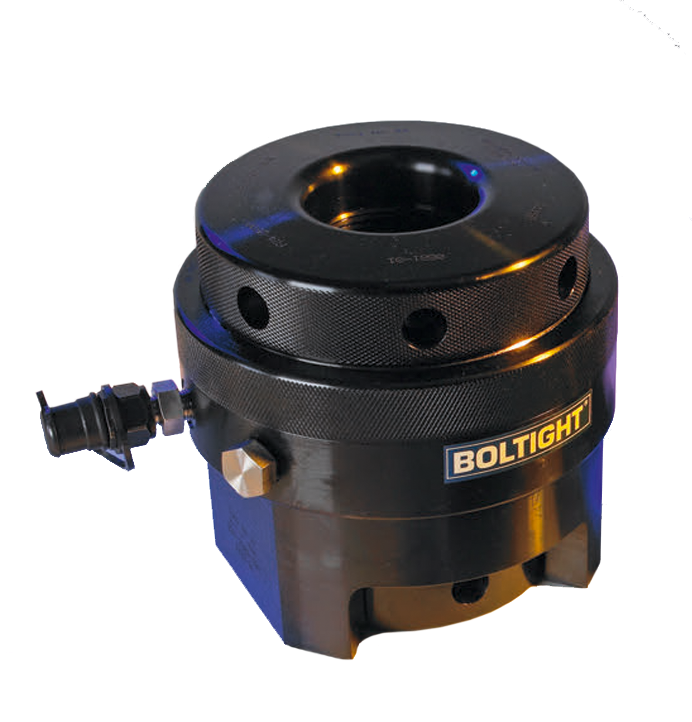 Proper bolt tightening is critical to the operation and safety of most mechanical devices. Generally speaking, the heavier or more powerful the piece of equipment, the greater stress the bolts are put under and the more important that the bolts provide sufficient clamping force. In the case of large bolts, hydraulic wrenches, or tensioners are needed to tighten bolts sufficiently to create adequate clamping force. In order to understand the difference between torque wrenches and tensioners, we must start with an understanding of the theory behind bolt operation. These simple mechanical devices operate by providing clamping force to hold two objects together. While in many cases the bolt also provides support to the objects being clamped, its primary purpose is to provide clamping force. This clamping force is maintained by the spring tension that is inherent in the tightened bolt. In the process of tightening the bolt, it is stretched microscopically. The elasticity of the material used in the bolt’s manufacture causes it to want to return to its original unstretched shape. This spring tension causes the clamping force and together with the friction in the bolt’s threads, works to prevent loosening. So, ensuring proper clamping force and the maintenance of that clamping force is a function of ensuring that enough spring tension is created in the bolt while tightening it. Both torque wrenches and bolt tensioners work to create this spring tension by stretching the bolt. However, they use different means to accomplish it. Torque wrenches provide this tension by the amount of rotational force they apply to the bolt. As the force is applied, it the threading draws the nut face and bolt head closer together, stretching the bolt and creating the clamping force. This is the most common form of providing load to a bolt. For high clamping force a large amount of torque is needed; hydraulic wrenches can provide this force. With hydraulic wrenches, torque is controlled by the hydraulic fluid pressure. The higher the pressure, the more torque is applied to the bolt. As hydraulic fluid doesn’t compress, this provides very accurate and consistent torque values. Torque has been used as a means for controlling bolt loading and clamping force for many years. Therefore, there are standard torque tables available, which provide guidance for determining the correct amount of torque to be used for a particular size and grade of bolt. For the greatest possible accuracy when specifying torque for a particular application, it is important to take into consideration a number of other factors, all of which can affect the amount of clamping force that a particular amount of torque applies. Bolt tensioners work by preloading the bolt, stretching it before the nut is installed. The tensioner is clamped to the bolt’s threads and pushes against the flange in the surface being bolted. This provides a very consistent amount of stretch to the bolt, ensuring consistent bolt stretch and clamping force. 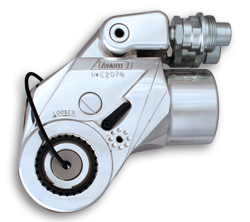 The amount of bolt stretch is controlled by the hydraulic pressure applied to the tensioner. Since the bolt will be pre-stretched by the tensioner, minimal torque is needed to tighten the nut onto the stud. The necessary clamping pressure or bolt load is accomplished by release of the tensioner, allowing the natural elasticity of the bolt to provide the clamping pressure. Spirited discussion still rages over whether torque wrenches or bolt tensioners are the better means for tightening heavy bolts to produce high bolt loads. Both tools have their advantages and their disadvantages. It is important to use the method recommended by the manufacturer of a particular piece of equipment, whether torque controlled hydraulic wrenches or tensioners, in order to ensure that the bolts are properly tightened for that application.